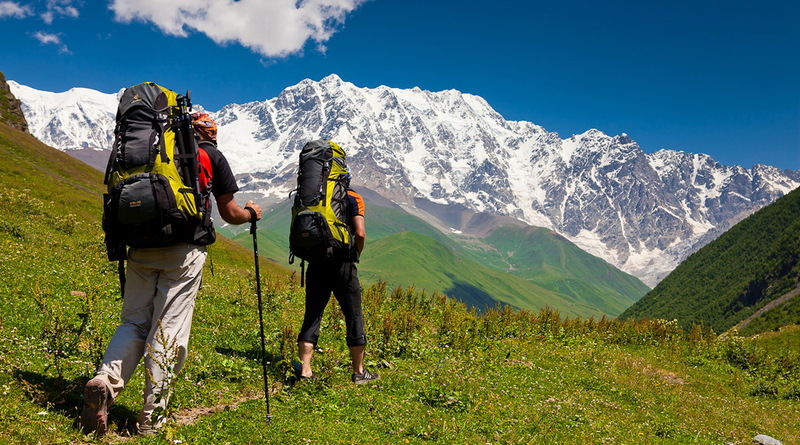 The compelling fascination with the highest mountain range on Earth, the Himalayas, draws thousands of climbers and trekkers from around the world each year. Discover Treks offer an 18 day jeep safari through Himachal Pradesh including the remote areas of Spiti. This trip is comfortable camping at its best. The group, limited to a maximum of 12 people, travels in 2200 cc Peugeot engine Armada jeeps; sleeps in base camps with deluxe 12′ tents with real beds (or in special 16mm fiber tents with foam carry mats and in rest houses where there are no base camps) and is served first class meals of Indian, Chinese or Continental cuisine. A jeep support vehicle with staff and supplies accompanies the group. The ‘summer capital’ of British India sprawls along a crescent-shaped ridge at an altitude of over 2100 metres in southern Himachal Pradesh. This was the most important hill station in India before Independence. The famous main street, The Mall, runs along the crest of the ridge and is lined with stately English-looking houses, Christ Church, Gorton Castle and the fortress-like former Viceroyal Lodge. Along the narrow streets which fall steeply away from the ridge are colourful local bazaars. There’s an interesting walk to Jakhu Temple, dedicated to the monkey god Hanuman. It’s located near the highest point of the ridge and offers fine views of the town, surrounding valley and snow-capped peaks and literally hundreds of monkeys. Lake Nako and the village, at 2950m, with it’s beautifully sculpted terraced fields, grand views and gallant efforts at forestation, could be reason enough to call this unique location the Crown of Kinnaur. It also has it’s own monastery commemorating the sojourn of Padmasambhava, the first disciple of Buddha to Tibet, A check post at Sumdo, only 20 kms from the Chinese border, is the official entry to Spiti. Kaza is the administrative centre of Spiti and its busiest market-place. People are friendly and curious, their hardiness sometimes an unintended mockery of foreign tourists suffering for the first time the effects of high altitude and the intense dryness of the air and environment. Hospitality is built into the tenuous condition of life and any request for assistance is generally met with humour and sympathy. A side road from Kaza leads up to Ki (11kms) and Kibber (18kms) monasteries, and continues to Gete, the highest electrified village in the world. From there it is possible to walk down a very steep path back to Ki. This monastery is dramatically situated on the steep slopes of a rocky outcrop. The monks are most welcoming and busily engaged in construction maintenance, toward which any donation is gratefully accepted. The fertile Kullu Valley in northern Himachal Pradesh rises northward from Mandi and Aut and heads toward the 3978-metre-high Rohtang Pass. In the south, the valley is little more than a narrow, precipitous gorge, but further north it widens into a beautiful region of stone-fruit and apple orchards, and terraced rice and wheat fields. This idyllic scene is dwarfed by huge deodar forests and the snow-crowned rocky peaks of the Parvati and Barabhangal ranges. The valley is home to friendly, devout and hard-working hill people, and to Tibetan refugees and nomadic shepherds. From Shimla, the route descends sharply down to the Sutlej River and the ancient Hindustan-Tibet Road. Another 70 kms of increasingly winding road perched above the Sutlej river and we reach the confluence with the Baspa river at Karcham. We follow the Baspa, first narrow and steep for 18kms, then widening at Sangla village in a forested and cultivated valley of several villages. Orchards of apple and apricot are in full bloom and many households are still spinning and weaving woolen blankets with intricately designed borders on primitive wooden looms. The fortress temple of Kamru, with it’s beautifully carved wooden portals, clings precariously to the mountainside above Sangla watching over the peaceful activity of the valley. Continuing up the Hindustan-Tibet road, one passes, Rekong Peo and Kalpa, the administrative capital of Kinnaur. Taking the side road up to these towns, an indescribable panorama of mountains emerges to the East. The centrepiece is the holy Kinner- Kailash, one of the seven holy Kailash peaks spread across the Himalayas. At the confluence of the Sutlej and the Spiti rivers, the valley narrows alarmingly into the Dobling gorge and the road winds upward to the border of Spiti district. Spiti is a high altitude desert and home to the endangered snow leopard presently under study in the adjacent Pin Valley National Park. The Spiti river flows south-east for 150 kms originating in the glaciers above KumzumLa, the 4900m. high pass leading to the district of Lahaul. From Sumdo the valley widens and recent efforts at forestation provide patches of soft green in an otherwise harshly eroded landscape. About 30 kms. upstream, the important monastery town of Tabo is a suprise in its simplicity. The single-storied sandstone and mud buildings of this 1000 year old monastery houses a most valuable collection of Tibetan Buddhist religious art. In the eleventh century, the Spiti area was called The Kingdom of Guge and was a part of Tibet. In July and August 1996, celebrations took place in Tabo at which the Dalai Lama performed the Kalachakra Initiation Ceremony. The next monastery of historical importance is Dankar. Impressive from a distance and providing an excellent view up the Pin River Valley; ufortunately, close-up view shows the buildings are in a state of disrepair. Manali is the main tourist center and a favored haunt of Indian honeymooners. The area around Manali is still one of the most beautiful in the valley, with hot springs, waterfalls, temples and pretty villages.